A demonstration post to demonstrate posting a Google Docs document to Google Blogger post for the post Add documents, spreadsheets and PDF files to blog. instead, and you will no longer have to worry about what happens in the future. press ctrl+C or right-click and select "copy" to copy into the clipboard. Scroll to the top of your post, and paste this just before the first alphabet you want to be large and colored. Immediately after this first alphabet, either copy </span> from the script at the bottom of the post and paste it immediately after the first alphabet, or, this is what I myself preferred as it is easy to do, type </span> myself immediatlely after the first alphabet. Now scroll to the bottom of the post, and highlight all the text plus spaces between the last alphabet and </p>, click the DELETE key to delete everything except </p> at the end of the post, and publish. A blog reader asked for visitor's registration. The only thing I can think about is either a Guestbook or a Shoutbox. I have written about Guestbook at Guestbook for your blog with an example at Natural Remedies. Clicking on the links in Guest will take your visitors away from your site (though you may chose to have the new site open in new window). If you want visitors to remain on your site, you will have to install a Shoutbox. You can see an example of one at Medical Matters at the bottom of the right sidebar. Try leaving a message in that Shoutbox. To see your work, click VIEW BLOG. NOTE: All the below instructions are for posting comments or for preparing posts in the EDIT HTML mode, not the COMPOSE mode. Click "Replace all" and all the < will be replaced by . You can repeat the process for >. Once that is done, you can highlight all the changed code, copy-paste into the comment box or the post editor window and submit your comment or publish your post. For other special characters, refer to How to publish special characters (click BACK) button to get back to this page). Note that in this case, there is an extra "New Post" and "Customize" link for you to click so that you can make a new post or get into the LAYOUT (highlighted with a white circle). If you don't see the "New Post" or "Customize" link, and you are already logged into a particular Blogger account, but don't want to log out, this is where having more than one browser will come in handy. I have 4 - Internet Explorer, Firefox (my favorite and also recommended by Blogger), Opera and Flock in my computer. You need not worry this may cause any problem to your computer unless you are using a very old computer with very limited memory. Opera used to work well with Blogger but not anymore. See Problem signing into Blogger with Opera. I now use Flock with very little problem except it does not have the Google toolbar and the built-in Google search box which I frequently use. Then check the inbox of all the email addresses you ever had to see if you have an email from Blogger which will list all the usernames that you have ever used with the email address plus instructions on how to reset the password. 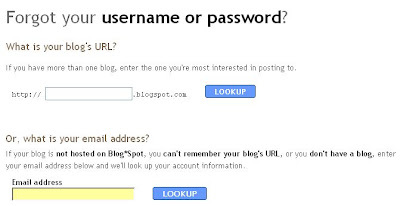 If this failed, or if you actually see the username (email address) plus "New post" and "customize" in the navbar, but cannot see the blog in the Dashboard, as some blogger have complained, then I am afraid your only hope is to try to contact Blogger Support or Problem logging into Blogger or unable to see blog in Dashboard, etc.. It may be difficult to get a response from them, but if you get an automated response, make sure you reply to that email with all the details of your problem including things like operating system, browser, etc. Some bloggers have pretty good fortune in getting help that way, including one who got help the same day she was referred to the above posts. I myself have got problems solved that way a couple of times. New bloggers often miss this as the delete button is not displayed in a prominent place. If you want to delete a blog, sign into Blogger (Dashboard) and you should get a lists of all your blogs (obviously you will see only one blog if you have created only one). Click SETTINGS at the right of the section for the relevant blog, and by default your will be in the BASIC sub-tab. Scroll right to the bottom of that page, and you should see a "Delete This Blog" button. Click that button and you will be asked to confirm. If you are sure you don't want the blog, go ahead and confirm and your blog will be gone from the web. However, note that if your blog had been indexed and cached by search engines, surfers may still be able to see the cached copy of the blog until it is deleted from the cache. That may take some time. Before you make the final decision to delete a blog, I hope you take time to read this post Why you should not delete your blog and what you should do if you change your blog URL. Update: Because of spammers grabbing the URL of deleted blogs for spamming purposes, Blogger has changed it to reserving the URL of deleted blogs for the original blogger's account to claim back later. If you are using an old classic blogger template, you will have the new Label (category of tag) feature in the New Blogger, but you will not be able to add a Label List in the Sidebar. The labels will only appear at the bottom of the post. If you want to have a Label List in the sidebar like those using the New Blogger template, you will have to add it manually. In this case, you see only one label, but it could have been more if you had wanted to add more when you publish or edit your post. You just add more labels, separated by commas. Supposed I want a Label (category or tag) list in the sidebar of a blog using the old classic template. What I need to do is to click on one of the labels at the bottom of the post (or right-click and select "copy link location (Firefox) or "copy shortcut" (Internet Explorer and Flock) to copy URL into clipboard) and you will be taken to the page where all the posts having that label will be displayed. Copy the URL from the address bar at the top of the browser. Frequently, the subject is stated as "Help" or something vague. It would be good to give a more descriptive subject like "How to track visitors to my blog?" or something like that. It will also help to provide the URL to your site. It will help to give as much information as you can about your problem. If you got a specific error message, give the error code. Telling us what version of Blogger (old classic Blogger or New Blogger) you're using will also help as well as telling us if you have tried using other browsers (see What to do when you cannot upload photo, publish post, load a page, sign in, etc. and Why you should be using more than one browser. There actually was a reader who commented in my post Error Messages which outlined what are the possible steps to take when encountering error message, but he just mentioned he had problems with the Polls: A New Blogger widget just out of beta (Blogger in Draft) which he said was broken plus he could not delete it, but didn't mention if he had tried all the suggestions that was given. I tested adding a poll at Good Health Information and found it was working fine, and not only that, I could delete it and add it back again without problem. Anyway, it was a good thing that I found out that not only he had that problem, but some other bloggers had the same problems, and referred him to Problem with Polls which is just out of beta (Blogger in Draft). I hope that solved his problem. You can read more about Polls, a new Page Element for New Blogger.